I wrote the words in green, and Laurie wrote the words in brown. 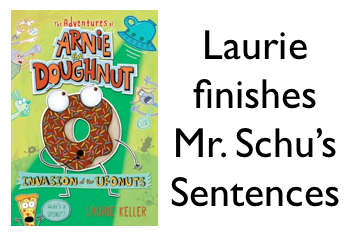 Bowling Alley Bandit and Invasion of the Ufonuts are the first two books in my new series, The Adventures of Arnie the Doughnut. I wanted to write some early chapter books and was thinking up characters to write about (which I’m still planning on doing) when my editor, Christy Ottaviano, suggested I try writing one about Arnie. She knew that when I go to school talks kids always ask for more books about him and sometimes even start chanting his name. 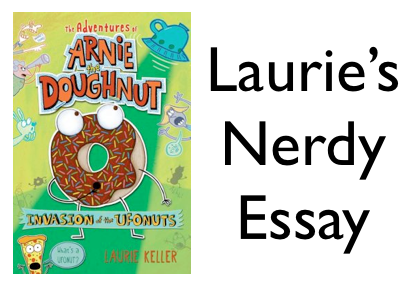 I hadn’t planned on writing more books about Arnie because I figured he was settled happily as a doughnut-dog, living with Mr. Bing, but once I started playing around with the idea I knew it was something I wanted to pursue. I like the new format and having more pages to draw out jokes. I have to be pretty sure though that kids will understand the jokes since they’re “front and center” rather than in random asides as I use them in picture books. 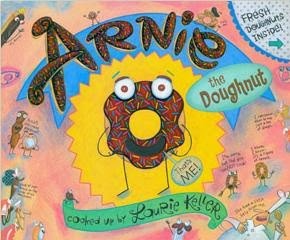 Arnie the Doughnut first appeared in a pastry case in his self-titled picture book, Arnie the Doughnut. I got the idea for the book after stepping into a Krispy Kreme doughnut shop for the first time in NYC. I stood for about 20 minutes watching the doughnuts being made and thought they looked like little characters coming to life. I was so intrigued by the process that I decided then and there to write about one of them. Composer/lyricist George Howe wrote a musical adaptation of Arnie the Doughnut! He and director/adaptor, Frances Limoncelli, developed the show for the Lifeline Theater in Chicago. I was so impressed with George’s song-writing skills and the professional quality of whole production. It was really exciting to see the characters from my book come to life in such a way and to see how the audience responded to it. In 2012 the show was performed with a new cast in the New York Musical Theater Festival. It was so SURREAL to see a book I created while living in NYC come full-circle (unintended doughnut pun) and be performed in a Broadway theater. It was an INCREDIBLE experience! My studio for the past 8 years wasn’t much to speak of. I lived in a cute, little cottage with no room for a studio (cue the violins please) so I worked in the corner of my living room (need a tissue yet?). As a result I always felt like I needed to be careful as to not make a mess so I started creating most of my of illustrations on the computer. I liked working digitally but I missed painting and having room to work and play. BUT I recently bought a house and am in the process of fixing up a big loft studio. It’s full of windows and skylights and it overlooks Lake Michigan — truly a dream come true. I’m looking forward to having several work stations so I can start painting and collaging again in addition to digital work. Picture books are and always will be in my blood. I started collecting them more than 20 years ago after discovering books by Lane Smith, Jon Sciezska, Maira Kalman and Petra Mathers. Their work was what made me want to make picture books of my own. It’s exciting every time I see one of my stories in print and I’m grateful every day that I have a career doing something I would do just for fun. 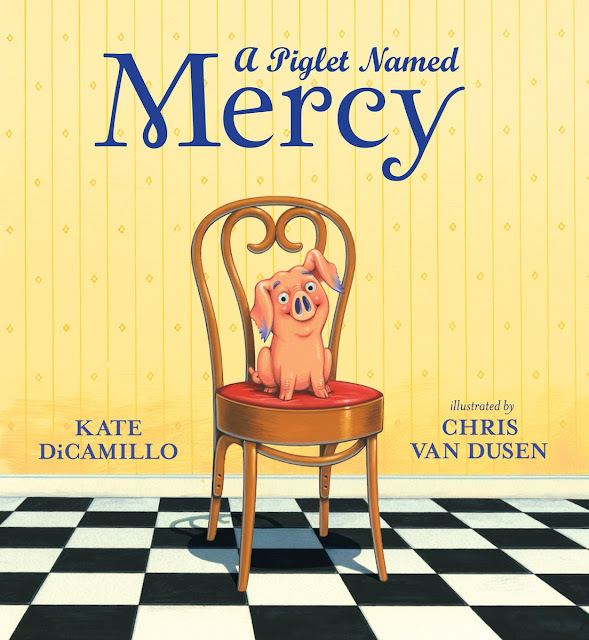 But the big BONUS of making picture books has been seeing how kids respond to them (at school visits and book signings). When they laugh and quote their favorite lines to me it melts my heart! Mr. Schu, you should have asked me about my penchant for inanimate objects. When I was a kid I was convinced that anything and everything had feelings — the raggedy gum wrapper on the side of the road, the leftover hotdog on the grill, the stray shoe in the middle of the highway (how does that happen anyway?). I’d see these things, lost and alone, and it would tear me up inside. I always figured I’d grow out of that but I haven’t (a friend dubbed me the Patron Saint of Inanimate Objects). I can’t go into a store and pick something off the shelf and leave one by itself — it kills me. So most times I buy them both (I know, I know — FREAK SHOW! Tell me about it — it gets EXPENSIVE!). Once in awhile I can resolve my angst by placing the leftover item near another somewhat similar item (maybe a different scent or size) so it’s not alone. I always hope it will make new friends — and maybe even bond by chatting about a beloved book. 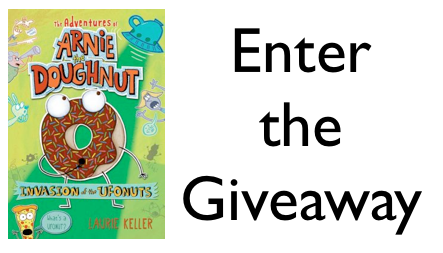 I am giving away a copy of Invasion of the UFONUTS. 1. It will run from 3/9 to 11:59 p.m. on 3/11. 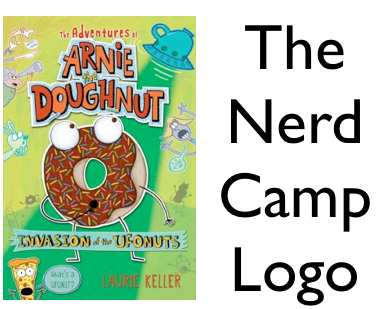 Laurie Keller designed and illustrated the logo for Nerd Camp 2014. I love my buddy Laurie Keller. She's a genius!!! (Love Mr. Schu and Colby too!) Fun post! Oh, I love that! So I'm not alone? : ) I can't walk through a store without re-hanging clothes that have fallen to the floor. I imagine their tearful reunion once the stray shirt is back on its hanger with its friends.